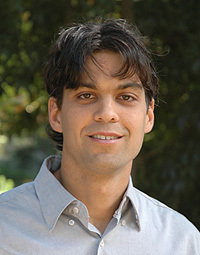 Enrico Ramirez-Ruiz, assistant professor of astronomy and astrophysics at UC Santa Cruz, has won a prestigious Faculty Early Career Development (CAREER) award from the National Science Foundation to support his research on compact objects, such as neutron stars and white dwarfs, as well as a program to increase college graduation rates of Hispanic students. The CAREER award provides $500,000 over the next five years to fund Ramirez-Ruiz's research and teaching activities. The NSF program recognizes "junior faculty who exemplify the role of teacher-scholars through outstanding research, excellent education, and the integration of education and research." Ramirez-Ruiz won another prestigious award last year, a Packard Fellowship in Science and Engineering. His NSF project, titled "Compact Objects in the Era of Celestial Cinematography," will analyze how the interplay between compact objects and other stars could yield clues to the properties of these extreme forms of matter. Compact objects are created when normal stars exhaust their nuclear fuel and collapse, shedding their outer layers (sometimes in a spectacular supernova explosion) and leaving behind an extremely dense core. Such a remnant is difficult to observe directly, but collisions with other stars or the transfer of matter from a gravitationally bound companion star can make these otherwise invisible objects light up, Ramirez-Ruiz said. "These interactions could yield observations which, when compared to the results of computer simulations, provide firm conclusions about the nature of compact objects," he said. The comprehensive numerical modeling of encounters between stars requires a suite of computer software codes to treat the diverse range of physics and timescales at play. The requirements include realistic treatments of nuclear physics, radiation transport, general relativity, and hydrodynamics. So far, most work in the field has been piecemeal, with different groups addressing individual aspects of the problem, said Ramirez-Ruiz. His goal over the duration of the grant is to develop a theoretical framework that will allow complete models to be built for a wide variety of stellar encounters. Ramirez-Ruiz's proposal for the CAREER award also includes an education and public-outreach program designed to increase the retention and graduation rates for Hispanic students enrolled in a two-year college. He plans to join forces with the faculty and staff of Hartnell Community College in Salinas to identify potential transfer students who show promise as researchers and are members of groups traditionally underrepresented at UCSC. Key components of the program include intensive research instruction through summer internships, academic counseling and mentoring, and workshops that integrate family members. The goal is to promote diversity while increasing the number of students who attend and graduate from UCSC with degrees in physics.